Universal trading adviser on custom indicators for MetaTrader 5. The xCustomEA works on a custom indicator and has the ability to program its own trading strategy for MT5 terminals. Limitations of the DEMO version: Works on any characters on a DEMO account or USDJPY on a real account. Dear friends and users of our EAs, please add your ratings in the Reviews section. All updates to our forex software are free! You can program individual indicators and signals for: open, close, filter, stop loss, take profit. All other settings are identical with the settings of The X and include more than 200 parameters. SIGNALStrategyInputs - External parameters for custom indicator, You can specify external variables of the indicator as they are written in the settings table, separated by commas! Indicator example file updated! + StrategyShift removed from indicator file !!! Added operation mode for the current zero bar(Shift=0)! Attention! The current bar only forms a signal, so we do not recommend using Bar # 0(Shift=0) to receive signals! Attention! Some indicators forcibly do not draw a signal at 0 bar! - It is right. Therefore, the adviser will not open positions using Shift = 0. - Optimization of the code, increasing the speed of testing. 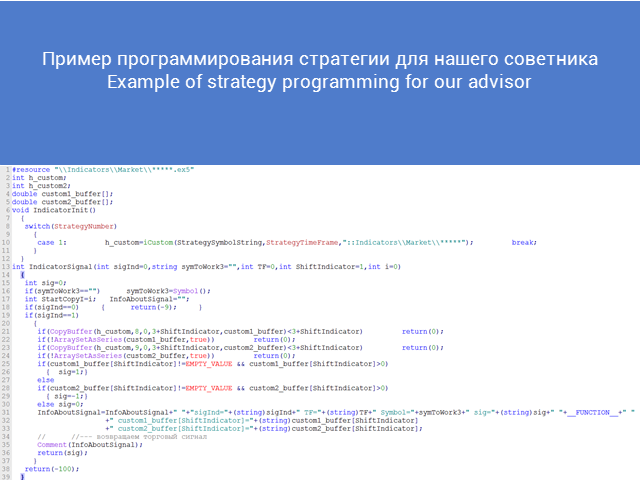 - When you first start the advisor, an indicator template file is created for programming your strategy. 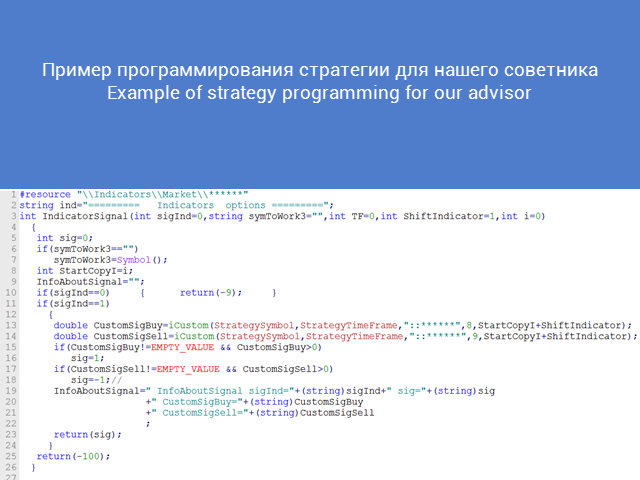 A file is created in your terminal \ Files folder with name "Ind - The xCustomEA TEMPLATE.mq*"
You can open this file and follow the programming instructions of your custom strategy. 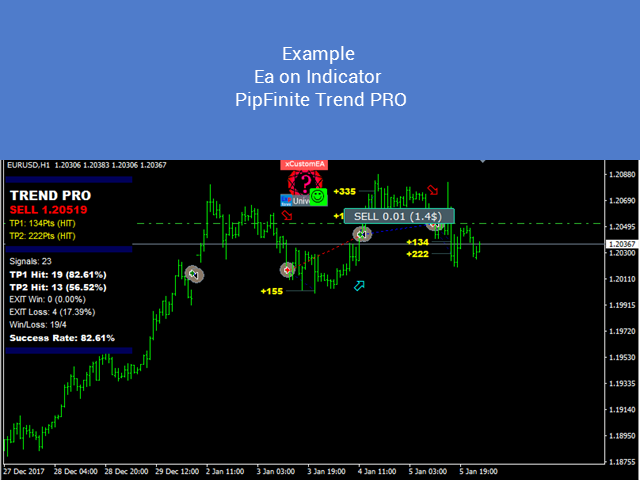 - In connection with the update of the sample files and our custom indicator Ind - The xCustomEA TEMPLATE, we updated all the variables of the adviser and added an additional type: to the SLTPTypeIndicator type xCustomEA, to call from our example indicator. - Modified indicator indicator files for receiving signals for the operation of new functions and blocks! Be attentive! - Added block control signal closure for custom indicator. This block allows you to close open positions by signals of a custom indicator. It is used if a custom indicator provides signals for closing positions (separately from the signals for opening a new position). If you need to tell the adviser signals to close positions, then you need to specify: the indicator name (may be identical with the indicator name for closing positions), a set of parameters (If they differ from the default indicator parameters), TimeFrame, Bar Shift, and number buffers to receive signals for closing. Separately for BUY and SELL positions. Attention: If you want to close a position when receiving the opposite signals, then you do not need to use this block. - Added Stop Loss and Take Profit control unit based on custom indicator signals. This block allows you to set a stop loss or take profit when opening positions on the signal, which can be taken from the values ​​of the custom indicator buffers. If the Custom Indicator has separate buffers for getting Stop Loss or Take Profit, you can use these values ​​when opening a new position. Attention: Stoploss or take profit is set only when a new position is opened using a new signal. The functions of averaging, additional opening use the parameters of stop loss and take profit from past variables. Stoploss and take profit obtained from the custom indicator in Averaging and additional opening are not accepted. Stop loss and take profit from a custom indicator is also set when using the ForcedModifySLTP function. default), TimeFrame, Shift bar, and the number of buffers to get values. Separately for BUY and SELL positions and separately for StopLoss and TakeProfit. - Global update and improvement of the working code.